Our new children's book, The Hard Hat for Kids hits stores tomorrow. I wrote it with School Psychologist, Dr. Lauren Gallagher who fittingly is the wife of my college lacrosse teammate. 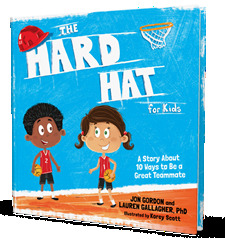 In the book we share 10 ways to be a great teammate and while these are great for kids to learn at a young age they are also great for adults to relearn. WORK HARD – do the best you can. Don’t focus on the outcome or results. Each day be your best for yourself and your team. EFFORT – it takes time and energy to be a great teammate. Your team doesn’t care if you are a super star. They care if you are a super teammate. When you put forth the effort to help others the team will improve. BELIEVE – believe in yourself. Believe in your team. Believe in what you can do together. When you believe in your team members their confidence and performance will rise. ENCOURAGE - we don’t give up because it’s hard. We often give up because we get discouraged. Your team members need encouragement. Encourage them. Speak life into them. We all need encouragement and when you encourage your team members you share the positivity they need to keep moving forward. FRIEND – is defined as a person who has a strong liking for and trust in another person: a person who helps or supports someone else. Being a friend to your team members means you support and help them. You let them know that you are there for them. OPTIMISM – no matter what challenges you are facing believe the best is yet to come. Don’t focus on your set backs and challenges. Learn from them and know that your vision and optimism are greater than your circumstances. See a positive future and work with your team to create it. RESPECT - not everyone on your team is like you. It’s important to respect your team members for who they are and the contribution they make. ENERGY – you can give it or take it. 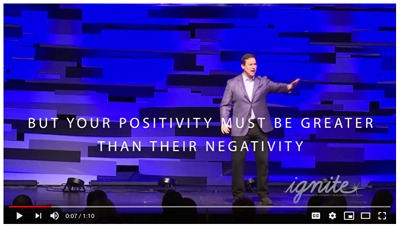 Be a giver and fuel yourself and your team with positive energy. MOTIVATE – one of the most rewarding parts about being on a team is the opportunity to raise other people up and to experience being raised up yourself. When you motivate your team members and they motivate you anything seems possible. Teams full of energy who motivate each other become a powerful force. ENTHUSIASM – it's contagious just like optimism and belief. When you are enthusiastic you lift up yourself and your team. Share your enthusiasm today. You'll notice that if you take the first letter of each word it spells "We Before Me." Me is important but when me contributes to we, everyone gets better. When WE comes before ME you become the great teammate and team you are meant to be. Gandhi said "I will not let anyone walk through my mind with their dirty feet." 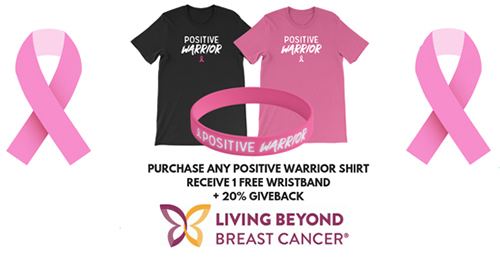 Purchase any Positive Warrior shirt and receive a pink wristband for free! 20% of each shirt sold will also be donated to Living Beyond Breast Cancer. I'll personally match the amount of money we raise.